« I should have been working…. Images like this are simple. Glossy (taking thru a glass window). Silly girlie. Precious. My Daddy and my youngest. This photo was snapped last week at the middle school track meet at our district’s stadium. 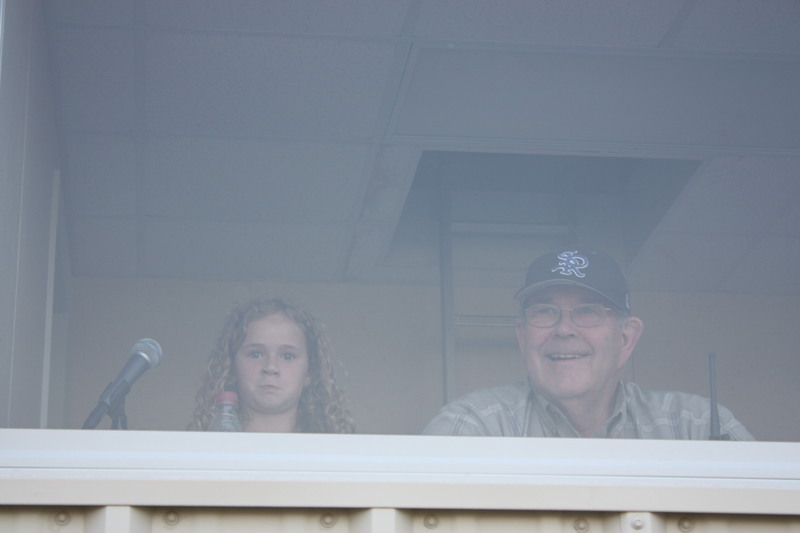 I was surrounded by my twin nephews during a good part of the track meet (which goes for HOURS) but I looked up behind me in the press box and there sat my Dad. Next to my dad was a curly headed goofy gal. My Daddy LOVES LOVES LOVES all things sports. My Daddy LOVES LOVES LOVES all things sports involving his grandchildren. With 8 grandchildren living in the same small town, he certainly gets a healthy dose of youth sports! This photo just seemed to capture both sides of my dad. I am SOOOOOOO grateful for our parents. They are so involved in our children’s lives. Simple images such as this one will last in my heart and mind forever. This entry was written by texasknights and posted on April 11, 2012 at 9:19 pm and filed under Family Times, Little Miss. Bookmark the permalink. Follow any comments here with the RSS feed for this post. Post a comment or leave a trackback: Trackback URL.